They drove through Sebois onto a logging road, and parked the pickup by a skidder trail that led to an old beaver flowage almost a mile back in. They’d caught trout here before; as far as they knew, no one else fished it and they expected to have it to themselves again. When they got to the flowage they decided to split up, Junior fishing downstream, Bob up. Bob had a small knapsack containing a hunting knife, some extra fishing equipment, and a bag of bologna sandwiches, and he left it on a stump in a small clearing at the edge of the skidder trail, about 50 feet from the flowage. They agreed to meet back at the clearing for lunch. Junior fished his way down the brush-choked stream, pushing through alders and raspberry bushes and thick fir. It was hot, the bugs were hungry, and the fish weren’t. About 10 o’clock Junior gave up and headed back upstream. When he got to the flowage, he headed directly for the bag of sandwiches, hungry. The knapsack was on the ground on its side, open. The sandwich bag was beside it, empty, and the papers the sandwiches had been wrapped in were lying flat and open beside it. The sandwiches were gone. Junior’s first thought was that Bob had beaten him to the sandwiches. He wondered why Bob had eaten all of them, and why he had thrown the papers sloppily on the ground. Both men were always careful not to leave trash in the woods. The thought that an animal, possibly a bear, might have done it, passed briefly through his mind. He yelled for Bob, but there was no answer. Junior decided to wait for him, so he headed back up the skidder trail a bit. A big tree trunk lay on the ground about 20 feet off the trail, and he sat on it. He was drowsy in the sun, but the black flies kept him from dozing. He was wondering for the 20th time whether he should head upstream to find Bob, when he saw something dark about 100 yards up the skidder trail, coming from the direction of the road. It was a bear. Junior wasn’t alarmed; at 32, he’d spent most of his life in the woods. He’d run his own woods operation for 10 years, hunted and fished whenever he had time, and was an experienced woodsman. He’d seen bears before, and had shot one a few years ago. He had absolutely no fear of them. He decided he’d sit still and let the bear pass by. It would be interesting to see how close it got before it scented him and ran off. It wasn’t particularly large for a bear; Junior’s practiced eye told him it weighed about 150 pounds or so, about what he himself weighed. The bear ambled slowly down the trail, and finally came to where Junior had left the trail and walked to the tree trunk. He’ll catch my scent now, he thought, and bolt. Instead, the bear took a 90-degree turn off the trail and headed directly for Junior. Junior was startled. The bear acted unconcerned, but kept coming. When it was only 10 feet away, Junior stood up and yelled. The bear stopped, and looked up, directly at Junior. Then the hair stood up along its back and it lips peeled back, exposing its teeth. It never made a sound. A clear, vivid thought came to Junior: I’m going to die. A wave of fear went through him, leaving him shaking and weak. His legs felt like rubber. The bear inched cautiously closer, lips still peeled back. A solid piece of dry wood about 4 feet long lay on the ground beside Junior, and he grabbed it. When the bear came within reach, he slammed it over the head with the club as hard as he could. The bear stopped and shook its head, and stared at Junior. Junior looked frantically around for a tree. There were a few 8-inch thick firs 10 feet or so away, but the only one within immediate reach was a small maple, about 6 inches thick. Damaged by a skidder, about 5 feet up the trunk bent over in a curve and ran parallel with the ground. At the top of the curve one solitary branch, about 3 inches thick, shot almost straight up. The minute Junior turned to look for a tree, the bear stepped closer. Junior whirled back and yelled, and the bear stopped in its tracks, only inches away. He doesn’t like eye contact, Junior thought. He stops when I look directly at him. Junior turned and ran the few feet to the maple, and scrambled up it. When he turned his back the bear rushed forward, stood up, bit him through the back of the calf of his right leg, and tried to pull him down out of the tree. Somehow Junior pulled free, climbed up to the limb, grabbed it, and stood up on the curved main trunk. Along with the shock of the bite, he felt a second of relief; I’m out of reach. The bear, still standing, reached up and grabbed the maple with its front paws and pulled itself easily into the tree. In seconds it was almost on the trunk, its head almost touching Junior’s feet. Junior scrambled and shimmied up the thin vertical limb about 3 feet. The bear climbed the rest of the way into the tree, steadied itself on the level trunk, peeled its lips back, and stretched its neck up to bite Junior’s feet. Hanging on with his hands, Junior let go of the limb with his legs, swung them out, then swung them in and kicked the bear under the chin with everything he had. He knocked the bear right out of the tree. The bear went immediately to the base of the maple, chewed off and bent the small shoots at the base, apparently to get them out of its way, and started climbing. When it got to the base of the limb again, Junior swung out and delivered another good kick. The bear fell out again, but this time caught itself by biting the trunk. It pulled itself back into the tree immediately. Junior climbed up the limb as far as he dared to go. It was only about 1 inch thick at that point, and it leaned dangerously, the top resting against a nearby fir. He was a good 10 feet above the bear, and hopefully out of reach. He drew his knees up hard. The bear stood up on the curved main trunk, gripped the vertical limb with its front paws, and stretched its neck towards Junior’s feet. They were just a foot out of reach. The bear stared up at him for a minute, obviously frustrated. Then it started to chew on the limb! Frantic, Junior swung and kicked again. His feet thudded solidly into the bear’s jaw and the animal fell completely out of the tree, and landed heavily. It sat there for a minute, looking back and forth at Junior, the base of the maple, and the adjoining fir. It was obviously thinking over its next move. If it went up the fir, Junior would be within easy reach. Junior was completely unnerved by the bear’s silent, methodical, persistent attack. This wasn’t an irrational, agitated defense of cubs or kill; this was a calm, deliberate, calculated attempt to kill him. He noticed that the bear wore two brightly colored ear tags. It’s a nuisance bear, he thought, trapped somewhere and released out here. It’s used to people. And it’s hungry. It wants to eat me. The thought came again, with the force of conviction: I’m going to die. He felt suddenly weak, and wondered if he was going to pass out and fall out of the tree. His heart hammered and his chest felt like it might explode. He wondered if fear could give you a heart attack; this must be what one feels like. He sucked in deep, gasping breaths, trying to steady himself and clear his head. Gradually he calmed. He screamed at the bear, and for Bob. Maybe if another person showed up, the bear would leave. The bear made up its mind; it got up, went to the fir, and started up. Junior was astonished at how fast it climbed. It literally shot up the tree, and was beside him in a second, well within reach. The thought flashed through his mind that he was lucky he hadn’t climbed one of the firs; he would have, if one had been within reach. The bear would have gotten him immediately if he had. He slid quickly back down the limb and stood on the bent trunk again. The limb straightened, out of the bear’s reach. The bear immediately came back down the fir, rushed to the maple, and started climbing. Junior shimmied back up the bending limb even further, until he was almost in the fir. This time the bear stood on the curve and started chewing on the limb again. On the third or fourth bite, Junior felt it crack and start to lean. The bear was having no trouble chewing through the limb. Suddenly Junior remembered the hunting knife in the knapsack back in the clearing. 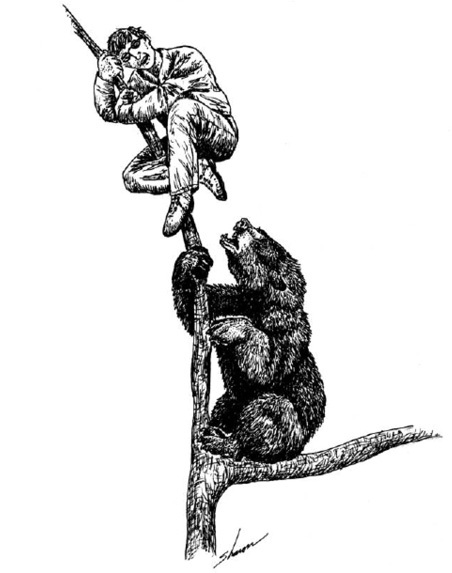 He knew he was coming out of the tree; if he jumped before the limb went over, he might catch the bear off guard and get a few seconds lead towards the knife. He let go of the limb and dropped a full 15 feet to the ground, fell, got up, and bolted for the clearing. He hadn’t gone 20 feet when the bear was on him. It bit him in the buttocks. Still standing, Junior pulled free and kept on going. It bit him in the rear again, and Junior pulled free a second time. Then it grabbed him with both front paws by the sides of the hips, bit him in the back, and down they went. They rolled and fell into a skidder rut, the bear on the bottom, on its back, paws in the air, Junior on top of the bear and on his back. He kicked and hit and scrambled to get free. The bear bit him again in the side, then Junior broke loose, staggered to his feet, and made it the last 20 feet to the clearing. He stopped by the knapsack and turned. The bear was right behind him, only 5 or 6 feet away. It stopped the instant Junior turned to face it. Junior yelled, grabbed a 4-foot long stick only an inch or so thick, and whacked the bear in the face. It shook its head, and actually took a couple steps backwards, to the edge of the clearing. The clearing was about 10 feet across, and surrounded with thick brush around three quarters of its circumference. The bear paced back and forth in the opening to the clearing. It still hadn’t made a sound. Three or four times it stopped and slowly eased closer, and each time, as soon as it got within reach, Junior yelled and whacked it in the face with the stick. Each time, the bear backed off. The stick wasn’t really big enough to hurt the bear, but it kept it at bay. Finally the bear started to circle the clearing, just inside the brush. It came to a small bushy 6-inch thick white pine, and stood up behind it, its paws crossed against the trunk. It blinked and looked at Junior. It looked like it was taking a break. Junior was exhausted; he felt like he was about used up, and he wondered if the bear was too. He knew the bear wasn’t going to quit, and he knew he couldn’t last much longer. For the third time the thought came to him that he was going to die, but this time the effect was different. It angered him. I’m not going to lie down and die, he thought. I have to do something. He got the hunting knife out of the knapsack. Its narrow blade was only 4 inches long, but it was sharp. He knew the bear could move fast; this was the best time, while it rested, with a tree between them. He rushed forward and jabbed through the branches at the bear’s neck. He missed, and the knife slid a couple of inches into the bear’s left front shoulder. Junior let go and scrambled back. The bear dropped to all fours, and the knife, caught in the thick branches, pulled free and fell out. They both stood frozen for a second, looking at each other. Then the bear turned, and ran back up the skidder trail to where it had first attacked. Junior heard it stop, just out of sight. He rushed to the pine, picked up the knife, rushed back to the center of the clearing, and waited. He heard the bear coming back, and then saw it moving through the brush 30 feet to his right, towards the beaver pond. It stopped at the edge of the water, lowered its head, and drank. Junior heard someone yell back on the skidder trail. The bear picked its head up and turned to look back. A small patch of blood glistened wetly on its shoulder. It turned again, splashed off across the flowage, and disappeared in the firs on the other side. As soon as the bear was out of sight, Junior ran back up the trail. Bob was standing near the original attack site, looking puzzled. Junior ran to him, and collapsed to the ground. Bob had been fishing his way back downstream when he heard Junior yelling. Thinking Junior wanted to eat, Bob had yelled back saying he wasn’t done fishing yet. But when the yelling didn’t stop he got concerned, cut through the brush to the skidder trail, and headed for the flowage. He never saw the bear. He was astonished when Junior stumbled toward him, pale and bloody, and collapsed. Junior finally got the story out. He was in shock, played out, exhausted. But he was safe. He let go completely; he just wanted to lay there. He wasn’t bleeding much, so Bob let him rest. Bob briefly considered going for help, but both men were afraid the bear might return if Junior was left alone. Bob’s arrival had scared the bear off; two people were evidently more than it wanted to deal with. They decided to wait until Junior could walk. Junior had hardly felt the bear biting him during the attack, but after half an hour or so the shock started to wear off, and the pain set in. It got him moving. He got stiffly to his feet, and took off his bloody shirt. Bob gave him his, to keep the black flies off. The pain got really intense. Junior could hardly walk, and had to stop and lay down twice. It took over an hour to get to the truck. They stopped at a house to call ahead to Dr. Bourcard Nissen in Lincoln, then drove to his office. Junior was lucky. Dr. Nissen treated him at the office and released him. He was in pain, and on crutches for two or three days, and he took rabies shots, but there was no serious or permanent damage. He does have some interesting scars, though, in some interesting places, most not available for public viewing. I interviewed Junior at his home, and when he got done with the story, I commented on how he kept joking about it. I asked him what stood out about the experience. “I’ve seen bears before,” he said, “and I’ve never seen one act like this. It was used to people. I felt like it was playing with me. That’s what got me going. Why was he released? There’s no question that bears used to people can be dangerous. What scared me most was that he never made a sound. “I was amazed that he didn’t swipe at me with his claws at all. He just tried to bite me. I think he could have had me; he was amazingly strong and fast for his size. He was afraid to face me directly, though. I got away from him in the skidder rut, and I held him off with that little stick. The only time he really attacked was when I turned my back. I’ll never run away from a bear with my back turned again. I’d walk backwards, always keep an eye on him. I think I could have made it to the knife if I’d done that. He was afraid of me, and he left the second Bob showed up. I asked him if he was afraid of bears now. I was impressed with Junior’s courage. For someone as frightened as he said he was, he acted coolly and did a good job defending himself. He did everything right. The classic advice of lying face down, covering the back of your neck with your hands, and passively waiting out the attack, may work with grizzlies, but it is absolutely the wrong thing to do during a predatory black bear attack. They want to eat you. Many black bear predatory attacks have been stopped by the victim fighting back.